The illustrations on this page have been compiled from a variety of sources. They are reproduced in accord with 'fair use' provisions unless copyright is otherwise noted. If advised that copyright has been infringed I will immediately remove the particular illustration(s). The celestial maps are from the edition of Aratus by Johann Buhle (Leipzig, 2 volumes, 1793-1801) who took them, with certain simplifying modifications, from Johann Schaubach's edition of the Catasterismi of Eratosthenes. They show the shapes and positions of the archaic Greek constellations as they would have appeared in the time of Pseudo-Eratosthenes and Hyginus. The celestial maps, following ancient Greek practice, are polar projections of the ecliptic of the forty-eight classical constellations of Ptolemy. The north celestial pole is placed between the tail of Ursa Minor and Draco. Modern star charts use coordinate lines centred on the celestial equator and poles. Because the stars were not observed to move relative to one another the ancient Greeks thought the stars were fixed on a sphere surrounding the sun and planets. If constructed, no celestial map has survived from ancient Mesopotamia. Likewise, no celestial map has survived from ancient Greece. The earliest Greek description of the complete celestial sky visible to the Greeks is the astronomical poem Phainomena by Aratus of Soli (written at the turn of the 3rd-century BCE). A number of celestial globes have survived from the Roman period. These are based on Greek uranography. According to the astronomer and researcher Susanne Hoffmann there are several hints pointing to uranographies in both cultures. The Mesopotamian scheme of uranography used what may be termed equatorial coordinates. The Greek scheme of uranography used ecliptical coordinates. It is difficult to ascertain a clear understanding of astronomical knowledge in the time of Homer and Hesiod - the earliest references to Greek astronomy that we have. The Homeric and Hesiodic texts do establish that at this period the astronomical knowledge of the Greeks enabled them to navigate and to reliably perform agricultural work. The only reference to stellar navigation occurs in Homer's Odyssey (Odyssey 5.271-277) when Odysseus sails from Ogygia after receiving instructions from Calypso. The conspicuous constellations that are mentioned in this passage - the Pleiades, Boötes, Orion, and the Great Bear - are obviously connected with navigation. The ancient Greeks are the main source of present-day Western star/constellation names. The present-day Western constellations are based on the classical Greek constellation set. Also, additional Western constellations were introduced in the 17th and 18th centuries both to fill the gaps remaining in the northern sky and to map the newly-accessible southern sky. The classical Greek constellation set of 48 constellations survived to the Renaissance through its inclusion in Ptolemy's 2nd-century CE Almagest, and preserved in the Arabic and Byzantine traditions. It would appear that Greek constellations were usually derived from Greek mythology. The Greek constellations were first described by Eudoxus, Aratus, Hipparchus, Ptolemy, (pseudo-)Eratosthenes, and Hyginus. There is a descriptive tradition and a mathematical tradition for locating the stars. Naturally, the descriptive tradition is earliest. In the descriptive tradition, the stars are located according to their position within the constellations; while in the mathematical tradition, the stars are located according to a set of coordinates. The Western tradition of describing stars by their positions within constellation figures may have begun with Eudoxus of Cnidus (circa 408-circa 355 BCE). It was certainly continued/established by Eratosthenes of Cyrene (circa 276-circa 196 BCE) and Hipparchus of Nicaea (circa 190-circa 120 BCE). The descriptive method had existed with the Babylonians circa the late 2nd-millennium BCE. The 3 classical texts setting out the constellation set we have inherited are: (1) Aratus' Phaenomena (3rd-century BCE, 45 constellations described); (2) Hyginus' De astronomia (1st-century BCE, 44 constellations described); and (3) Ptolemy's Syntaxis [Almagest] (2nd-century CE, 48 constellations described). Both Aratus and Hyginus locate stars descriptively. Ptolemy locates stars by using coordinates. The constellations described by Hyginus are mostly the same constellations described by Aratus, but some are given different names. In Germanicus only 42 constellations are described. Other major Latin translations of Aratus' Phainomena were done by Cicero, and Avienus. (However, the Latin constellation-titles used are from medieval European tradition, and are still current today. Today's Latin names sometimes vary from the names used by Aratus and later Ptolemy. Note: The Aratus Latinus is a crude anonymous translation. The 8th-century translation is more polished and usually referred to as the Revised Aratus Latinus.) The ancient Greeks named the most prominent stars and established the most obvious constellations by circa 800 BCE. The Greeks never thought of constellating the entire visible sky until circa the 5th-century BCE. By circa 400 BCE (likely under the influence of Babylonian uranography) the Greeks had, by borrowing and invention, established the majority of the 48 classical constellations. The Romans derived a considerable portion of their star lore and uranography from the Greeks. The star names Sirius ("Scorcher") and Arcturus ("Bear Watcher") are mentioned by Homer and Hesiod in the 8th-century BCE. Homer and Hesiod were two of the earliest Greek poets. Hesiod, a poet and farmer in Boeotia, a region of central Greece, likely lived about the same time or shortly after Homer. The earliest constellation/astral myth of the Greeks appears in Homer's Iliad (and was likely ancient at this time). It is the myth of Orion becoming a constellation after his affair with Eos (Dawn). The astral myth of Orion was first told in full in Hesiod's (now lost) Astronomy. (Fragments of Hesiod's Astronomy were summarised in the Catasterismi by the pseudo-Eratosthenes.) The first Greek works which dealt with the constellations were books dealing with star/constellation myths. The most complete extent Greek works dealing with the mythical origins of the Greek constellations are the Catasterismi by the (conventionally called) pseudo-Eratosthenes (a Hellenistic writer) and De Munitionibus Castrorum by the (conventionally called) pseudo-Hyginus (an early Roman writer). Each of these authors drew extensively from the writings of older sources such as Homer and Hesiod, and their successors. They provide a clear overview of the stories that lay behind the present-day Western constellations we use. The constellation scheme described by Ptolemy (Almagest, circa 140 CE) consisted of 21 northern constellations, 12 zodiacal constellations, and 15 southern constellations. There is some evidence for the existence of constellations in the late 3rd millennium BCE in Sumer (Ur III Period) and also in the Middle East in the city-states of Ebla and Mari. In the article "Further Notes on Birmingham Cuneiform Tablets Volume I." (Acta Sumerologica, Volume 13, 1991, Pages 409-417) the Assyriologist Wayne Horowitz (and co-author Philip Watson) include a brief discussion of possible evidence pointing to an Ur III origin of at least some constellation and star names. In her 2002 doctoral thesis "The moon and stars of the southern Levant at Gezer and Megiddo: Cultural astronomy in Chalcolithic/Early and Middle Bronze Ages." Sara Gardner identifies constellations, including a lion constellation (equated with Leo), existing during the Chalcolithic/Early Bronze Age (circa 4500-2200) in the Levant. (The drawings of animals in Cave 30:IV at Gezer are held to represent constellations.) In their article "The Geometry and Astronomy of Rujm el-Hiri, a Megalithic Site in the Southern Levant." (Journal of Field Archaeology, Volume 25, 1998, Pages 475-496) Anthony Aveni and Yonathan Mizrachi set out the astronomical sophistication of the construction phase of the Rujm el-Hiri complex. (The Greeks had only a few named constellations established by the time of Homer circa 800 BCE. There was no early intention by the Greeks to constellate the entire sky.) The appearance of elaborate constellation sets as reference systems covering most of the visible sky only originated with the development of complex societies. Complex constellation systems make their earliest appearances in the 2nd millennium BCE in the stable kingships of Mesopotamia, Egypt, and China. In these empires astronomy had become a state supported and state directed enterprise. Circa 350 BCE the Chinese astronomer Shin Shen prepared what may be the earliest star catalogue. It contained about 800 stars. The oldest known complete sky star map is the Dunhuang star map which originated in China. It is now usually dated to circa 700 CE and is most likely a copy of an older star chart. Its style and content has been identified as being similar to the Yue Ling astronomical text dated circa 300 BCE. Decanal "star clocks" decorated Egyptian coffin lids starting circa 2100 BCE (and ending circa 1800 BCE). They show that there was a system of 36 named equatorial stars rising within 10 days of each other (and were based on the civil calendar year). These Egyptian "star clocks" are the earliest detailed astronomical texts known. The decanal system can be identified as early as the Third Dynasty (circa 2800 BCE) and may even be earlier. Constellations are a means of organising the sky by dividing it into smaller segments. The development of a system of coordinates to enable the positions of individual stars to be located accurately was first achieved in Greece; but only after undergoing considerable evolvement. The fixed stars were first located only in very vague terms. In the Works and Days of Hesiod (circa 7th-century BCE) there exists only the most rudimentary system for identifying particular stars and where to find them in the sky. A first attempt at an exact coordinate system for locating particular stars was not to occur until some 500 years later with the star catalogue of Hipparchus. In the 2nd-century BCE Hipparchus originated a star catalogue in which also he tried to give some reasonably accurate locational coordinates for the stars he listed. However, the coordinate system he used to locate the positions of the stars on his list remains unknown. Hipparchus introduced the system of assigning Greek letters to identify the magnitudes (brightness) of the naked-eye stars in each constellation. Some 300 years later this system of designating stellar magnitude was adopted by Claudius Ptolemy. The term "early star catalogues" is also commonly applied to descriptions of Greek (and Babylonian) uranography prior to Ptolemy. With few exceptions these "early star catalogues", however, are distinctly different from what modern astronomers, from Ptolemy onwards, have meant by the term. With few exceptions, prior to Ptolemy star catalogues did not give the position of stars by any system of mathematical coordinates. They are instead qualitative descriptions of the constellations. They simply note the number of stars in each part of a constellation and the general location of the brighter stars within a constellation. (The type of description usually used is "near X is Y".) This cumbersome method of describing the location of stars in terms of their relative positions in a constellation was used by both the Babylonians and the Greeks. The pictorial arrangement of stars is not a star catalogue. A star catalogue proper gives accurate positions for each individual star regardless of the constellation it is grouped into. Also, the boundaries of the Greek constellations were subject to change up to the time of Ptolemy. Early in the 3rd-century BCE the Greek philosophers Timocharis and Aristyllus, using a cross-staff, accurately catalogued the positions (i.e., declinations) of some of the brightest stars. Timocharis, between circa 290-270 BCE, observed the declinations of twelve fixed stars. Aristyllus, continuing the program of Timocharis, observed between circa 280-240 BCE, the declinations of six more fixed stars. This is the first known Greek compilation of measured stellar positions forming a star catalogue. (See: "Ancient Stellar Observations Timocharis, Aristyllos, Hipparchus, Ptolemy - the Dates and Accuracies." by Y. Maeyama (Centaurus, Volume 27, 1984, Pages 280-310.)) It can be deemed the first true star catalogue. The first catalogue of stars over the entire sky probably originated with the Greek astronomer Hipparchus circa 130 BCE. One of the great achievements of Hipparchus was his (now lost) Catalogue of fixed stars. This star catalogue differed from the earlier and imprecise descriptions of the constellations. To compile his star catalogue Hipparchus apparently used an equatorial armillary sphere to measure the exact ecliptical coordinates (i.e., ecliptic latitude (angular distance from the ecliptic plane) and ecliptic longitude (angular distance from an arbitrary point i.e., the vernal equinox)) of approximately 850 stars. However, it is clear that at the time of Hipparchus a standardised system of spherical coordinates for denoting stellar positions did not exist. In the material that has survived Hipparchus does not use a single consistent coordinate system to denote stellar positions. He inconsistently uses several different coordinate systems, including an equatorial coordinate system (i.e., declinations) and an ecliptic coordinate system (i.e., latitudes and longitudes). (In his Commentary, obviously written before his discovery of precession, the positions of stars, when given, are in a mixed ecliptic-declination system.) In his Commentary on the Phaenomena of Aratus and Eudoxus Hipparchus largely chose to write at the same qualitative (i.e., descriptive) level as the two authors he critiqued. Only later, obviously after his discovery of precession, did he introduce a system of real ecliptic coordinates where the positions of stars are given in their latitude and longitude (and longitudes increase proportionally with time whilst latitudes remain unchanged). In Greek astronomy the stars within the constellation figures were usually not given individual names. (There are only a few individual star names from Greece. The most prominent stars in the sky were usually nameless in Greek civilization. If there was a system of Greek star names then it has not come down to us and also would appear unknown to Ptolemy.) Greek constellations ("star catalogues") up to the time of Ptolemy are descriptive. The Western tradition of describing the constellations by means of describing the relative positions of the stars within the constellation figures was firmly established by Eratosthenes and Hipparchus. In their descriptions to the time of Ptolemy the constellations were defined by the Greeks by their juxtaposition (i.e., descriptive comparison of positional relationship to each other). Prior to Hipparchus (and Ptolemy) the general goal of the Greeks at least was not accurate astronomical observation but artistic and mythological education. The end result was a sort of geographical description of territorial position and limits. Circa the 5th-century BCE many of the constellations recognised by the Greeks had become associated with myths. Both the star catalogue (constellation description) of Eudoxus (4-century BCE) and the star catalogue (constellation description) of Aratus (3rd-century BCE) adopted the vocabulary of myth. In his Castasterismi Eratosthenes (284-204 BCE) completed and standardised this process with each of the constellations being given a mythological significance. Greek astronomy began with the organisation of the more prominent stars into constellations. Bernard Goldstein and Alan Bowen have proposed that the original motivation for Greek astronomy was the construction of star calendars (parapegmata, which correlated dates and weather phenomena with the risings and settings of the stars). In Greece, constellations were introduced as an aid to identify individual stars in the sky in so that they could be recognised at their rising and setting. Connecting constellations to stories helped people to memorise their various stellar configurations, independently of their astronomical/time-keeping functions. The earliest known Greek parapēgmata (star calendars) were those by Euktēmon (5th-century BCE), Eudoxus (early 4th-century BCE), and Kallippos (late 4th-century BCE). The Phaenomena of Aratus was not a scientific work. The Phaenomena described the sky in poetic language and remained a major influence throughout classical antiquity. Without using technical terms, Aratus described the layout of the constellations in the sky and the myths behind their names, as well as meteorological implications of the rising and setting of certain stars. (The Phaenomena of Aratus was modelled on Hesiod's Works and Days.) Cicero (1st-century BCE) wrote that Aratus' poem was essentially a description of a celestial globe constructed by Eudoxus of Cnidos (circa 390-340 BCE): "[He] … described it in verse, not displaying any knowledge of astronomy but showing considerable poetical skill." Aratus' poetical slant and identification of constellation with mythological identities was continued by later authors, who assigned further mythological identities to constellations: Catasterismi falsely ascribed to Eratosthenes of Cyrene (circa 275-194 BCE), and Poetica Astronomica by Hyginus (1st / 2nd-century CE). Nothing is known of the star globe of Eudoxus. The Catasterismi: Because Aratus' Phainomena presented only a succinct pictorial description of the constellations it created a demand for a collection the mythological stories relating to the constellations together with a list of their stars. This was met by the work of Eratosthenes of Cyrene (circa 276-circa 194 BCE) on catasterisms. His work on catasterisms was in turn re-edited multiple times till it reached the form now known as the Catasterismi. (It is considered falsely attributed to Eratosthenes and is attributed to Pseudo-Eratosthenes.) It is a collection of separate, thematically and syntactically complete sections, each dedicated to one constellation and describing the myths and the position and number of the stars. When the Catasterismi was joined to the poem Phainomena the original order was rearranged so that the sequence of the constellations matched the sequence given by Aratus. It would appear that star globes preceded star catalogues. A celestial globe is a 3-dimensional map of the stars. A celestial globe shows the apparent position of the stars in the sky. The concept of constructing a physical model to represent the arrangement of the constellations appears to have originated in ancient Greece. The stars were perceived by the observer looking up at the night sky as being attached to the inside of a hollow sphere with the terrestrial observer being at the centre. Consequently, the earliest attempts to represent the constellations were by means of a star globe. The earliest star globes simply depicted the constellation figures. Star globes have been used since classical times and were produced initially by Greek astronomers. The beginning of construction of celestial globes can hardly be earlier than the existence of a spherical theory of the heavens. The Greek philosopher Aristotle (384-322 BCE) proved that the earth was round. Over 100 years later the Greek mathematician Eratosthenes of Cyrene (276-194 BCE) is said to have calculated the circumference of the earth with considerable accuracy. However, earlier Greeks posited a spherical heaven and that the earth was round. The Greek astronomer Hipparchus of Rhodes constructed the first celestial globe on record, but it is believed other celestial globes had existed before it. The Greek philosopher Anaximander of Miletus (circa first half of the 6th-century BCE) taught that the sky was a globe/spherical and possibly/probably also invented the celestial globe. It appears the actual term used was 'sphere.' Diogenes Laertius wrote that Anaximander of Miletus had made a sphere. Radim Kocandrle has made the point (2012) that unfortunately, the meaning of the term 'sphere' is not made clear. We do not know whether it was an armillary sphere (model), a celestial globe, or a drawing, or whether the term sphere is only due to an anachronism of later authors. There is no certainty that star globes existed before the time of Eudoxus, i.e., existed with Thales of Miletus and Anaximander of Miletus. It is indicated that the first Hellenic star globe was made by Thales of Miletus but it is not certain. The 5th- and 4th- centuries BCE saw the introduction of celestial mapping in Greece - including celestial globes. It is indicated that Eudoxus was the first Greek to make a comprehensive star globe. According to the Roman poet and orator Cicero (106-43 BCE), It is indicated that Aratus derived his entire systematic description of the constellations from the star globe constructed by Eudoxus. In Aratus' Phaenomena the description of the human figures at least seem to be taken from those on a star globe. However, a star globe is never mentioned. The earliest extant systematic description of the Greek constellations is found in the Phaenomena of Aratus. His astronomical poem contained the description of 43 constellations and named 5 individual stars. The most significant motivation for the construction of celestial globes with constellation figures originated with the astronomical poem Phaenomena by Aratus (1st half of the 3rd-century BCE). Both the Greek astronomer and mathematician Hipparchus of Rhodes (born Nicaea) (circa 190-120 BCE) and the Hellenic astronomer and mathematician Claudius Ptolemy (circa 90-170 CE) used mounted celestial globes. Greek artists gradually began to present the starry sky, particularly the constellations, on the surface of a globe and to place the celestial globe on the shoulders of Atlas who had already in Hesiod (circa 700 BCE) been given the role of carrying the heavens. The purely scientific celestial globes of the ancient Greeks and Romans were mostly constructed of wood. Later Greek and Roman celestial globes were constructed with the key celestial circles, a dark blue background to represent the night sky, and - post Hipparchus - the stars were indicated by their apparent brightness and colour. The apparent magnitude of stars was represented by discs of 6 different sizes and their colour by either red or yellow. The earliest star globe makers faced the principal problem of how to position the constellation figures - how are the constellation figures to be positioned on the surface of a star globe. The ancient Greek (and later) astronomers drew the constellations on globes both in sky-view and in rear-view - that is, with the observers inside or outside the globe - and sometimes even on the same globe. This was also done with descriptions of the constellations given in ancient texts. The terrestrial viewpoint is necessarily from the inside of the celestial sphere looking outwards. Hence, properly, the stars (constellation images) are to be observed from inside the star globe. However, without some elaborate special construction the constellation images cannot be viewed in this way - the view point for a star globe is from outside. The solution decided upon by the earliest star globe makers was to reverse the relative positions of the constellation images (stars) i.e., east to west for right to left direction, to match watching them from the outside of the celestial sphere looking inwards. This resulted in the depiction of constellation figures being depicted from the back, not only on star globes but also later on Late Antiquity drawings and later Medieval star atlases. The custom from Late Antiquity was to draw constellation figures, particularly the human figures, from the back, as if they were on a star globe. As example: Some of the illustrations in the Leiden Aratea i.e., Serpentarius, Perseus, and Orion. An exception is the figure of Aquarius which faces the observer but is revered right to left, still representing the constellation as it would be seen on a star globe. The same with the early Medieval star atlases. As example: Albrecht Dürer (1515) and Johann Bayer (1603). Johannes Honter (1541) - whose view point was inside looking outside - drew the constellations figures/stars from the front. A much later solution was - when simply drawing star globes - to depict the constellation figures/stars as seen by ignoring the convex surface of the globe and simply assuming that it is a concave surface. Note: The term Aratea (or Aratea carmina/Carmina Aratea) basically refers to 3 classical Latin translations; those of Cicero, Germanicus, and Avienus. In their use of Latin vocabulary and references to Roman life all 3 were distinctly Roman Phaenomena. (See: Lewis, Anne-Marie. (1983, unpublished PhD thesis). From Aratus to the Aratus Latinus: A Comparative Study of Latin Translation.) These surviving Aratea were gradually joined by multiple medieval renderings of Aratus' Phaenomena. The term Aratea now applies to a body of texts that comprise more than 60 manuscripts (and illustrations). The Aratea was almost the only source for medieval readers to gain information about stellar astronomy. The Aratus Latinus: Some time before or during the 8th century CE a Latin translation Aratus Latinus appeared. This translation was based on a text referred to as 'Φ' which was compiled some time between the beginning of the 2nd and end of the 3rd century CE. Hubert Le Bourdellès, based on his linguistic analysis (L'Aratus Latinus, 1985), suggested that it had been copied from an interlinear translation of the Greek Phaenomena. Le Bourdellès proposed that with the gradual decline of Greek, scholars first needed glossaries to read Greek and this led to a now lost 'bilingual' copy. When the Greek text was later abandoned the literal translation, titled Aratus Latinus, began to circulate separately from the first half of the 8th-century. Due to the poor standard of translation it was difficult to comprehend. A revised and modified version of the text was undertaken almost immediately. This text was called the Revised Aratus Latinus. The Revised Aratus Latinus: A revision of the Aratus Latinus (producing the so-called Revised Aratus Latinus, "Aratus latinus recensio interpolata") was most probably carried out in the second half of the 8th-century CE. The revision involved the elimination of the unintelligible/confusing parts of the text were eliminated and the meaning of the text was clarified, but without being collated with a Greek manuscript. The Revised Aratus Latinus, apart from correcting and omitting parts of the old texts, also added extracts from Latin works. The text of the Revised Aratus Latinus itself included numerous excerpts from Isidore, Hyginus, Fulgentius Mythographus and others. To a large extent the inclusion of extracts replaced the 2nd part of the poem on weather signs that was initially translated in the Aratus Latinus. Phaenomena flourished into the Middle Ages where it continued and consolidated the "two-sphere" view of the universe that predominated throughout antiquity. (The earth is fixed at the centre of the universe and surrounded the cosmos (an enormous celestial sphere) which revolves around it.) No overall detailed study has yet been published on the transmission and reception of the Aratea in the Middle Ages (the role the text of the Aratea played in West European astronomical studies from the 8th-century to the 12th-century; how the entire number of texts that make up the Aratea was read, commented on and copied during this period). The oldest extant manuscripts of the Phaenomena can be attributed to Theon of Alexandria. Later scribes of the classical period added commentary and illustrations, contributing to the continuation of the work's popularity in the Roman era. During the course of the Roman era there were numerous translations, adaptations, and imitations of the poem. The Phaenomena was translated into Latin by (for example) Cicero, Germanicus, and Avienus and also adapted by its Roman translators. Extensive textual corruption of the text resulted in the 8th-century Aratus Latinus, a distorted and problematic manuscript that has posed a challenge to Aratean scholarship for more than a millennium. In the late 16th-century the Dutch scholar Grotius attempted to correct the text, and this process has continued to the present-day. Jean Martin's edition of the Greek text (2nd edition, 1998) is considered definitive. Douglas Kidd's 1997 translation and commentary of the Phaenomena is highly regarded by classical scholars. Both Martin and Kidd made use of new manuscript evidence in reconstructing Aratus' Phaenomena. Ancient celestial globes were (usually) fitted with a meridian ring to enable them to be rotated around the polar axis in order to present the daily motion of the sky. By means of the meridian ring and an additional horizontal ring they were supported on some form of frame. A celestial globe mounted in this way enabled the rising and setting of the constellations and stars to be to be determined. These celestial globes were an important feature of in schools teaching astronomy and in the practice of astrology. Prior to the Greek system of naming and describing constellations the Babylonians gave single or short names (and descriptions) to the constellations they originated. The Babylonian scheme of constellations, excepting for the development of the zodiacal scheme of 12 constellations, was mostly finalised by the late 2nd-millennium BCE (i.e., near the end of the Cassite Period circa 1160 BCE). The only significant change that took place in the early 1st-millennium BCE was the development of the 12-constellation zodiacal scheme (and the shift from the scheme of the "three ways" to the ecliptic as the primary celestial reference point). The Babylonian names for the stars forming a constellation are descriptive phrases that serve to identify their location within the constellation figure. In a section of the Mul.Apin astronomical compendium, due to the use of the horizon as reference point for a list of simultaneous risings and settings of constellations, these particular constellations are approximately identifiable. The earlier Babylonian "star calendars" (commonly misnamed "Astrolabes") do not provide any suitable information to enable the identification of the constellations. This is simply because we do not have any information regarding the principles of their categorizations. Tablet 1 of the Assyrian Mul.Apin compendium (circa 1000 BCE) contains a qualitative description of constellations and the star positions comprising such. The incomplete Neo-Assyrian text (VAT 9428, circa 400 BCE) from Assur originally contained a complete qualitative star by star description of the Babylonian constellations. The evidence indicates that most of the Greek constellations were introduced from the 6th-century BCE to the 4th-century BCE. It would be reasonably accurate to say that during this period - and even much later - different Greek astronomers would change the constellation boundaries, if not the actual constellations. The constellation figures of the Greek sky, and most constellation boundaries, only became standardised after Aratus (i.e., with Ptolemy). It is known that some Greek constellation figures shared the same star (or even stars) within their respective boundaries. There are 3 illustrations for this: (1) Aratus included Serpens in Ophiuchus, and Lupus in Centaurus. Serpens was separated from Ophiuchus, and Lupus separated from Centaurus by Hipparchus/Ptolemy. Lupus is described by Eratosthenes as a "Wine-skin." Aratus separated the Pleiades from Taurus whereas Hipparchus made the Pleiades an asterism of Taurus. Aratus' description of of Perseus (specifically the left knee) is criticised by Hipparchus. (2) From Neugebauer's, A History of Ancient Mathematical Astronomy: "Ptolemy states that he had repeatedly changed the the boundaries of constellations and quotes some examples where he deviates from from Hipparchus. ... When Ptolemy says that he had redefined the association of many single stars with respect to the traditional constellation configurations he adds the remark that his predecessors did not act differently." (Part 1, Pages 286-287). See Part 1, Page 336 for differences between Aratus, Hipparchus, and Ptolemy regarding Cassiopeia and Perseus; and Part 2, Page 1027 regarding the drastic regrouping of stars in Virgo by Ptolemy to that of Hipparchus. (3) Grasshoff in his The History of Ptolemy's Star Catalogue states (Page 40): "The decrease in the number of constellations in the course of the [Greek] development of the constellations can be deduced by comparing the number of stars in Ptolemy's constellations with [those in] the Hipparchian register. The oldest constellations, the zodiacal signs [constellations] have a disproportionately larger number of external stars, indicating that the area of the constellations was reduced in the course of time." The final consolidation of the classical Greek star names and constellation figures was accomplished by the polymath Ptolemy circa 150 CE in his book The Great System of Astronomy. (Originally called the Syntaxis by Ptolemy and then called the Almagest by the later Arabic translators.) Ptolemy did not identify the stars in his catalogue with Greek letters, as is done by modern astronomers. Each of the 1025 stars listed was identified (1) descriptively by its position within one of the 48 constellation figures; then (2) by its ecliptic latitude and longitude; and then (3) its magnitude (using a Greek letter). (Stars that did not fit into the figure of a constellation were stated to be outside the constellation and their position described in terms of their relationship to the nearest constellated stars.) It is this particular star catalogue method of Ptolemy that enables us to identify, with considerable exactness, the boundaries (i.e., shape) of the ancient Greek constellations. The identities of some of the stars in Ptolemy's list still remain completely uncertain due to errors in Ptolemy's measured coordinates and lack of precision in described positions. An additional source of star/constellation names originated with the groups of nomadic desert Arabs of the (pre-Islamic) Arabic Peninsula. However, according to Paul Kunitzsch, the influence of earlier Babylonian nomenclature are sometimes discernable in this body (older group) of (non-standardised) star/asterism names. Paul Kunitzsch also holds that the main body (younger group) of indigenous (pre-Islamic) Arabic star/asterism names were probably formed in the period 500-700 CE. Islamic star mapping mostly followed the Ptolemaic tradition. Ptolemy's star catalogue remained the standard star catalogue in both the Western and Islamic world for circa 1000 years. The dome of a bath house at Qusayr 'Amra, the only remaining building of an Arab palace in Jordan built circa CE 715, contains a unique hemispherical celestial map. The surviving fragments of the fresco show parts of 37 constellations and 400 stars. This celestial map furnishes a connecting link between the classical representations of the constellations and the later Islamic forms. In pre-Islamic times the early Bedouin Arabic people (i.e., the nomadic desert dwelling tribes of the Arabic Peninsula) gave individual names to the numerous stars. (It is still erroneously believed that the folk tradition of Arabic star names was preserved as the lunar mansions. It was Julius Wellhausen (Reste Arabischen Heidentums (1897)) who correctly concluded that the concept of 28 "lunar mansions" was borrowed from the astronomy of the Hindus and merged with elements of Arab star lore after the introduction of Islam. Later Islamic scholars attached seasonal almanac lore onto this imported calendar system.) This particular practice has ultimately influenced the naming of individual stars in Western constellations. Whilst our inherited constellation names are basically Greek our European inherited star names are largely due to the influence of medieval (Arabic) Islamic astronomy on medieval European astronomy. The influence of Arabic names on Western star names dates from around the 10th-century AD when Arab astronomy flourished. (The Arabs (correctly Arab-Islamic astronomers) increased the number of individual star names. Most individual star names were introduced by al-Sufi when he published his own version of Ptolemy's Almagest in the 10-century CE.) After the demise of the Roman Empire most Greek scientific works were translated into Arabic (including Ptolemy's Almagest). Eventually these texts were re-introduced back into Europe (and into Latin and Greek) through Arab Spain. With the Arabs the influence of the Greek language was not very strong in the names of stars and constellations. Modern star names are mostly derived from Arabic translations (or use) of Ptolemy's Almagest, chiefly Shiraz astronomer al-Sufi's 10th-century book Kitab suwar al-kawakib (Book of Constellation Figures), and also the introduction of hundreds of Arabic astrolabes into Europe. Al-Sufi's book Kitab suwar al-kawakib is our best authority for post-Islamic Arabic star-names and constellations. It also included the folk tradition of Arabic star names. The Renaissance period was the catalyst for their being mixed together and passed down to present-day in Latin characters. The retransmitted Latin translation of Ptolemy's Almagest by Gherardo of Cremona (Lombardy) in the 12th-century was an Arabic-Latin version. This began the distorted use of Greek-Arabic-Latin words that appear in modern lists of star names. It was the only version known in Western Europe until the later discovery of copies of the original Greek texts and their translation into Latin texts in the 15th-century. Commonly used present-day individual star names include: Aldebaran, Algol, Altair, Antares, Arcturus, Betelgeuse, Canopus, Capella, Deneb, Fomalhaut, Mira, Pollux, Procyon, Regulus, Rigel, Sirius, Spica, and Vega. Present-day Western star and constellation names originated from a number of Near Eastern and Mediterranean cultures. The cuneiform evidence recovered since the mid 1800s indicates that Greek uranography borrowed from the earlier Babylonian uranography, established circa late 2nd-millennium BCE. Some late Egyptian influence is also indicated. The Renaissance period saw the appearance of philological studies into the history of stellar nomenclature. The focus of these philological studies was the Arabic and Latin names of the medieval period but also included classical Greek and Roman names from a few recovered classical texts. During the Renaissance period (broadly the 200 years between 1400 and 1600), and also the post-Renaissance period (particularly the heyday of celestial mapping in the 17th- and 18th-centuries), European astronomers also searched through the philological studies for new individual star names to apply to the star charts and celestial globes they developed. One such philological work was A learned treatise of globes by the English scholar John Chilmead (Latin edition 1594; English translation 1638). Wilhelm Schickard, the astronomer and professor of Oriental languages at Tübingen, supplied the Arabic letters and star and constellation names for Coelum stellatum Christianum by Julius Schiller (1627). Julius Schiller's Christianised star atlas was a part of the Counter-Reformation attempt to de-paganise the heavens and substitute Judeo-Christian imagery. The Italian Theatine monk, mathematician, and astronomer Giuseppe Piazzi (1746-1826) introduced nearly 100 new star names (mostly "Arabic") in his Palermo Catalogue published in 1814 (his 2nd star catalogue). These star names were derived by Giuseppe Piazzi from the philological study Tabulae longitudinum et latitudinum stellarum fixarum ex observatione principis Ulugh Beighi (1665) by the English Orientalist Thomas Hyde (1636-1703). The German historian, chronologist, and astronomer Ludewig Ideler (1766-1846) made an important and long-standing (but flawed) contribution to the philological study and historical explanation of Arabic star names. His Untersuchungen über den Ursprung und die Bedeutung der Sternnamen (1809) was used as a basic reference source for over 150 years. The basis of the book was Ideler's translation of the astronomical section of Zakariya' al-Qazwini's popular 13th-century cosmography, 'Aja'ib al-Makhluqat (The Wonders of Creation), supplemented with Ideler's additions and annotations from classical and other sources. Unfortunately, Ideler did not have access to al-Sufi's 10th-century book on the fixed stars (Kitab suwar al-kawakib (Book of Constellation Figures)). Due to the author's additional use of numerous unreliable and mostly secondary Arabic sources the book unavoidably contains numerous errors. The constellation scheme established in Ptolemy's Almagest remained virtually unchanged until the European era of celestial mapping in the 17th- and 18th-centuries. During this period astronomers added their own constellation inventions to the remaining gaps left in the sky. There was no agreed standardised set of constellations. (One celestial atlas had 99 constellations.) Constellation schemes and boundaries remained unregulated until the early 20th-century. (Generally, celestial atlases in the early 20th-century varied between 80 and 90 constellations. Constellation boundaries also varied from atlas to atlas.) Until the 1920s astronomers used irregular curved boundaries (wavy-line boundaries) to demarcate the constellation areas. The issue of (1) the number of constellations, and (2) their boundaries, was taken up by the International Astronomical Union (IAU) in 1922. (The IAU was founded founded as a professional body for astronomers. Its purpose is to promote and safeguard standards in astronomy through international cooperation.) In 1922, at its first General Assembly, the newly formed International Astronomical Union (established 1919) officially adopted and regularised 88 official constellations (or at least took up the issue), and in 1928(9?) defined their boundaries. Acting at the request of the International Astronomical Union the Belgian astronomer Eugène Delporte (1882-1955) then proceeded to draw up the definitive modern boundaries for these 88 constellations. His work on the demarcation of the constellations was published in his book Délimitation scientifique des constellations, cartes (1930). The boundaries between the constellations were fixed along lines of right ascension and declination for the epoch 1875. Basically the constellation boundaries became rectangular borders. This made the use of traditional constellation figures obsolete. A transition to non-pictorial star maps had taken place with the 1928(9?) IAU decision on constellation boundaries. Constellations are now precisely defined areas of the sky and not regarded as star patterns. Constellations are now defined by their boundary lines (rectangular borders), not by their historic figures. This ensured that constellations now completely cover the sky and all stars lie within the boundary of a constellation. Enclosed within modern constellation boundaries are both the stars in the traditional constellation figures and the neighbouring stars outside the figures. The 88 official constellations selected by the International Astronomical Union were all of European origin simply because the wide use of these constellations was already well established. Naming constellations was what really mattered in the Western tradition. A few stars were individually named in Egypt (i.e., Sirius was named Sopdet circa 3500 BCE) and in Mesopotamia (i.e., Sirius was named KAK.SI.DI (Bowstar) circa 1200 BCE). The practice of giving individual names to numerous stars only really began with early (pre-Islamic) Arab astronomy (Arabian Peninsula) and medieval Arab-Islamic astronomy. A lot of star names that remain in present-day use can most often be traced directly or indirectly to Al-Sufi's Book of the Fixed Stars. A lot of the star names are simply translations of the stars' descriptions in Ptolemy's Almagest. Thus, Ptolemy's descriptor "star in the tail of the lion" becomes Denab (tail) al-Asad (of the Lion), later corrupted to Denebola. Eudoxus of Cnidus (life dates variously given as circa 408/400/390-circa 355/350/340 BCE) was a prominent Ionian Greek mathematician and astronomer. All the works of Eudoxus, have been lost, only fragments remain. See: Die Fragmente des Eudoxus von Knidos by François Lasserre (1966). According to one version, Eudoxus was taught astronomy by Archytas (Architus) of Tarentum (in Magna Graecia, an area of southern Italy which was under Greek control in the 5th-century BCE). According to another version, Eudoxus studied geometry under Archytas of Tarentum (a Greek Pythagorean mathematician without independent achievements in astronomy), a Pythagorean. Archytas (428-347 BCE) was an ancient Greek philosopher, mathematician, astronomer, statesman, and strategist. He was a scientist of the Pythagorean school and famous for being the reputed founder of mathematical mechanics, as well as a good friend of Plato. He spent most of his life residing in Italy. Practically nothing is known of Archytas' astronomy. However, it is quite clear that Archytas' astronomy does deal with the visible heavens, with the risings and settings of the stars and planets. There is a case for Babylonian astronomy being introduced to the Greeks through Philip of Opus and Eudoxus of Knidos. (Philip (or Philippus) of Opus (Opous), was a Greek philosopher and a member of Plato's Academy during Plato's lifetime. Philip of Opus is probably identical with the Philip of Medma (or Mende) the astronomer, who is also described as a disciple of Plato.) Eudoxus of Cnidus had an astronomy school at Cyzicus. He was a contemporary of Plato. Eudoxus was the most significant geometer in the pre-Euclidian period. His 4th-century BCE geographical treatise, the Gēs periodos ('Circuit of the Earth'), systematically described the lands and people of the known world, from Asia in the east to the western Mediterranean. Eudoxus produced works of a descriptive and empirical type in astronomy and geography. His astronomical works are thought to have included observations of the stars - a systematic almanac of celestial events. Eudoxus eventually built an observatory on Cnidus (not much higher than the dwelling-houses) and from there he observed the star Canopus, the lowest visible bright star in Cnidus ( Strabo (65 BCE-23 CE, Greek geographer and historian, Geography, Book 2). Eudoxus was the founder of the first known observatory. (At the time of Eudoxus, Cnidus was locate at 36° 41' north (the city having moved from an earlier site in 390 BCE. The declination of Canopus at this epoch was -52.839, giving a true altitude at transit of 0.478 degrees, which is refracted to 0.904 degrees. Canopus would be visible at any extinction coefficient < 0.2 magnitude per air mass.) According to an anonymous Greek commentator of Aratus it was Eudoxus who brought Assyrian uranography to the Greeks. In his works Eudoxus gave descriptions of a large number of constellations known in Mesopotamia. Eudoxus continued the Mesopotamian traditions of constellations in the Mul.Apin series. The detailed description by Eudoxus of the constellations - especially the use of the 12 zodiacal constellations - depended in part on Babylonian traditions. Eudoxus was a parapegmatist. Eudoxus produced a pioneering work known as the Phaenomena, in which he described a calendar with references to the risings and settings of constellations. The popular astronomy of the type found in parapegma, based ultimately on Mul.Apin type models, circulated outside Mesopotamia throughout the Mediterranean basin between circa 500 BCE and 500 CE. It is reasonably indicated that the Ionian Greeks obtained detailed knowledge of the Mesopotamian constellations in the century or so preceding Eudoxus. Walter Burkert (Weisheit und Wissenschaft (1962, Pages 289-296)) believed he had found evidence for renewed contacts with the East in certain features of Greek astronomy in the period following circa 440 BCE but his evidence is debatable. Circa the 5th-century BCE saw the beginning of mathematical astronomy in Greece. Also, Greek astronomy of the 5th-century BCE, like that of the astronomy of the Near East, was intertwined with the study of meteorological phenomena generally (i.e., with clouds, winds, thunder and lightning, meteors (shooting stars), the rainbow and such). Evidence for direct constellation borrowing by the Greeks from Mesopotamia is almost non-existent. During the Hellenistic period it is possible that Berossus and some Chaldaean contemporaries made the Babylonian sphaera familiar to the Greeks. It is possible that Babylonian uranography was passed to the Greeks through particular intermediaries such as the Phoenicians and Egyptians. There were likely "competitive" schemes of Greek sphaera until the wide adoption of the sphaera developed by the Greek astronomer Eudoxus of Cnido and diffused through his written works on the constellations (4th-century BCE). The ultimate success of the Sphaera Graecanica as we have it today (i.e., its complete acceptance by the Greek world and later the Roman world) was largely due to the work of the Greek astronomer Eudoxus of Cnidus (4th-century BCE) and the Greek poet Aratus of Soli (3rd-century BCE). Eudoxus constellated and catalogued the entire Greek sky in his works Enoptron and Phaenomena. Aratus later turned these works into an astronomical poem concerning the constellations. The Phaenomena became hugely popular in the Graeco-Roman world. Without this popularisation by Aratus the works of Eudoxus may never have exerted the lasting influence they achieved. Eudoxus was likely the first Greek to summarise the Greek system of constellations. Circa 360 BCE it appears that the Greek astronomer and mathematician Eudoxus of Cnidus extended and consolidated the previously unorganised use of constellations in Greece into a set that covered the whole of the sky visible in Greece. (Prior to Eudoxus the works of the Greek astronomers usually only contained limited details regarding the constellations, and a few ideas about the risings and settings of stars/constellations.) Eventually - with some minor changes and additions in later periods - the star group system of Eudoxus became canonical. It is likely that it was Eudoxus who included some previously named asterisms/constellations such as the Pleiades and the Hyades in larger constellations. Although nothing by Eudoxus has survived much of his work can be understood in Aratus' Phenomena and Hipparchus' Commentary. It is clear that the constellations of Eudoxus were thought of as the outlines of actual figures in the sky and not simply as star groups. Eudoxus carried out the first systematic constellating of the Greek sky. He also the first systematic consolidation of and description of the constellations of the Greeks. The constellations he used in his uranography were a mix of Mesopotamian constellations current at that time mixed with constellations in use by or established by the Greeks at the period (late Greek Archaic Period/early Greek Classical period). Eudoxus may have been the first Greek to employ Babylonian zodiacal signs each equal to one twelfth of the ecliptic circle. It appears that Eudoxus was aware of the Babylonian division of the ecliptic into 12 equal parts. (Plato may not have been aware of the Babylonian division of the ecliptic into 12 equal parts.) The classicist and philologist François Lasserre (Die Fragmente des Eudoxus von Knidos (F. 2., 1966, Page 39)) refers to an anonymous commentator on Aratus claiming that Eudoxus brought "the Assyrian sphere" to Greece. The Greeks had begun the process of naming constellations before the time of Eudoxus but Eudoxus undertook to comprehensively describe the entire visible night sky. The first comprehensive Greek star map was established by Eudoxus. The principal astronomical accomplishment of Eudoxus appears to have been the development of a descriptive map of the visible night sky - he composed a detailed description of the constellations. The Western tradition of describing stars by their positions within constellation figures may have begun with Eudoxus of Cnidus (circa 408-circa 355 BCE). The observations made at his observatory in Cnidus, as well as those made at the observatory near Heliopolis, formed the basis of 2 books referred to by Hipparchus. These 2 (almost identical) prose works (both 4th-century BCE) were the Enoptron ('Mirror') and the Phaenomena ('Appearances'), the latter being thought by some scholars to be a revision of Enoptron. Hipparchus in his extensive Commentary (exegesis) states us that the works concerned the rising and setting of the constellations. The object of Eudoxus may have been to develop a practical manual for finding the time (hour) of night. Actual descriptions of constellations in Greece existed as early as Eudoxus, circa early 4th-century BCE. The Greek astronomer Eudoxus, circa 375 BCE (/360 BCE), is considered to have constructed the first star chart (= appears to have been the first person to develop a standardised map of the Greek constellations). (Eudoxus is also considered to be the 'father' of Greek scientific astronomical observations.) He named a number of conspicuous stars and compared their brightness. A complete set of Greek constellations appears to have been first described by Eudoxus in 2 works called the Enoptron and the Phaenomena (both of which are no longer extant). Phaenomena was likely a revision and expansion of Enoptron. (Eudoxus appears to have been the first Greek person to have comprehensively arranged and described (i.e., summarised/consolidated) the Greek system of constellations (Greek constellation set).) Our information is obtained from secondary sources as his work is has not come down to us. The early method of the Greek astronomer Eudoxus for determining the places of the stars was to divide the stars into named constellations and define the constellations partly by their juxtaposition, partly by their relation to the zodiac, and also by their relation to the tropical and arctic circles. The complete (and standardised) constellating of the Greek sky (with 48 constellations) was possibly first achieved by Eudoxus in his work Phaenomena. The versification of his uranography in Aratus Phainomena indicates that the astronomic work of Eudoxus was accepted as authoritative. Aratus' Phaenomena was a practical manual in verse to teach the reader how to identify constellations and predict weather. It was one of the most popular literary works of the Hellenistic and Roman periods. It is the starting point for all studies of Greek constellations and star lore. It contains an occasional reference to a myth associated with a particular constellation. With only a few exceptions no actual stars are described by Aratus - only constellation figures. This method was undoubtedly inherited from Eudoxus who produced a set of descriptions of constellations in which the relative positions of stars in each of the constellations was described. Unlike later Greek astronomers (and modern astronomers), Eudoxus did not deal with the stars singly, and define their places by celestial measurement (i.e., he did not define their right ascension and declination, nor their latitude and longitude). Eudoxus instead gave a sort of geographical description of the territorial location (position and limits) of stars using a system of constellations distinguished by unique names. The method used by Eudoxus for determining the places of stars was to distribute named constellations over the entire visible night sky and then define stars partly by their juxtaposition, and partly by their relation to the zodiac, and to the tropical and arctic circles. The complete (and standardised) constellating of the Greek sky (with 48 constellations) was possibly first achieved by Eudoxus in his work Phaenomena. It is, however, the oldest known complete description of the celestial sphere. Circa 270 BCE the Stoic poet Aratus paraphrased the description of the constellations composed by Eudoxus. The paraphrase by Aratus follows the geographical method of Eudoxus and describes only the positions of the constellations and the principal stars in them relative to each other. There is no mention made of the longitudes or latitudes, the right ascensions or declinations of the stars singly. The only circles of the celestial sphere mentioned are the tropics, the equator, the ecliptic (and the Galaxy as if it were a circle of the sphere). There is no realistic evidence that an Aratean scheme of constellations existed earlier than the time of Eudoxus of Cnidus (4th-century BCE). To argue that the evidence is now lost or not yet recovered is to sidestep the particular difficulty with speculation. The ancient Greek world was composed of numerous city-states. There were also different schools of Greek astronomy. However, from circa 350 BCE, due to the efforts of Eudoxus of Cnidus, a unique system of constellations was consolidated in the Greek world. It appears that Eudoxus did not mention the planets. They are not mentioned by Hipparchus in his Commentary and only barely mentioned by Aratus in his Phainomena. This indicates they were only briefly mentioned by Eudoxus in his Enoptron and Phainomena. However, Eudoxus is also linked to the theoretical model of rotating celestial spheres centred on the Earth that were to explain the motion of the planets. There is reason to believe that during the lifetime of Eudoxus representations of the night sky on a plane surface was in use. The evidence is that in the description of some of the northern constellations a misplacement occurs which Attalus explained had arisen from the circumstance that the figures constellation figures are drawn as seen from a point on the exterior of the sphere; and Hipparchus, in his remarks concerning the passage, asserting the mistake, states that the constellation figures are drawn just as we see them, meaning that they are drawn as seen by an observer placed at the centre of the sphere. Attalus of Rhodes (flourished 2nd-century BCE) was a Greek grammarian, astronomer, and mathematician, and was a contemporary of Hipparchus. Attalus wrote a commentary on the Phaenomena of Aratus. Attalus sought to defend both Aratus and Eudoxus against criticisms from contemporary astronomers and mathematicians. Although this work has not come down to us Hipparchus cites him in his Commentary on the Phaenomena of Eudoxus and Aratus. Though there is really no positive statement for such in ancient literature it is thought that Eudoxus likely constructed a celestial globe. Allusions to the existence of celestial globes date to the Greek scientists Eudoxus of Cnidos (circa 409-356 BCE) and Archimedes of Syracuse (circa 287-212 BCE). Cicero recorded the tradition that Eudoxus had constructed a star globe that accurately depicted the constellations. (It is thought that Eudoxus was the first Greek to make a comprehensive star map and place it on a globe.) Likely the constellations were represented/depicted by the characters and animals representing them. The early Greek astronomers and philosophers constructed 3-dimensional models; brightly coloured celestial globes, and mechanical representations of the workings of the moving sky. Archimedes of Syracuse (287-212 BCE) also constructed a mechanical planetarium of the known celestial system (which was later much admired by educated Romans). It appears that Eudoxus of Cnidus was the first to draw the constellations on a globe representing the sky seen from the outside looking inwards, rather than as seen by an observer on the earth looking outwards (together with the main celestial circles). Ancient Greek and Latin astronomical poems were highly influential in establishing celestial cartography in the ancient and medieval period in Western Europe. Aratus of Soli was a Greek didactic poet who flourished in Macedonia in the early 3rd-century BCE (circa 315 BCE/310 BCE–240 BCE). Several accounts of his life are extant, by anonymous Greek writers. His only surviving work is his hexameter poem Phainomena (Phaenomena) ("Visible appearances") a book describing the constellations, some other celestial phenomena, and weather signs. The Phainomena of Aratus, probably composed in the period circa 280-260 BCE is an account in 1154 hexameters of: (1) the fixed constellations and their conjunctions, and (2) of weather-signs associated with both heavenly bodies and other natural phenomena. The opening of the poem asserts the dependence of all things upon Zeus. It has been stated that in form the Phainomena belongs to the Alexandrian school. The Phainomena is not a star catalogue per se. It has usually been thought that the purpose of the Phainomena is to give an introduction to the constellations, with the rules for their risings and settings; and of the circles of the sphere, amongst which the Milky Way is also included. The positions of the constellations, north of the ecliptic, are described by reference to the principal groups surrounding the north pole (Ursa Major, Ursa Minor, Draco, and Cepheus), whilst Orion serves as a point of departure for describing the constellation to the south. The immobility of the earth, and the revolution of the sky about a fixed axis are maintained; the path of the sun in the zodiac is described; but the planets are introduced merely as bodies having a motion of their own, without any attempt to define their periods. Nothing is said about the moon's orbit. A more recent assessment of Aratus' Phainomena is somewhat different. The Phaenomena is an astronomical calendar based on the stars. The Phaenomena has usually been considered to be primarily an astronomical work oriented toward the identification of major constellations and the exposition of related myths and stories. A 2nd part of the Phaenomena, called the Diosemeia ("Weather-Signs"), gives attention to ancient principles of meteorological forecasting. Aratus provides an explanation of celestial order; a celestial (star) calendar, and also an explanation of the type of meteorological phenomena that accompany the movement of the constellations. The 2nd half of Phaenomena (the Diosemeia, the "Signs of Zeus") explains what constellation signs bring what type of weather, at which times of year, and what agricultural and nautical activities accompany them. The planets were passed over briefly and left unnamed because they did not serve any purpose as practical celestial signs for agriculture and navigation. (In the proem the constellations are signs provided by the benevolent Zeus. The poem is about reading signs and the knowledge that they provide. The intention of Aratus was not not primarily to write an astronomical didactic poem, but rather to draw attention to the perceivable constellation signs in nature, which Zeus has benignly given to humankind. The closing section, ends with a concluding remark (Aratus: Phaenomena by Douglas Kidd, 1997, Page 157): "If you have watched for these [constellation] signs all together for the year, you will never make an uninformed judgment on the evidence of the sky." Eudoxus was a parapegmatist, and likewise Aratus. Aratus was a star calendar poet, an agricultural parapegmatist. Aratus' Phainomena draws extensively upon two prose sources which modern scholars can reconstruct with some confidence. For the constellations Aratus was very heavily indebted to the prose Phainomena of the pioneering Greek astronomer Eudoxus, written perhaps as much as a century before Aratus' poem. The relationship of Aratus' work to that of Eudoxus has been a matter of discussion since antiquity. The 2nd-century BCE Greek astronomer Hipparchus emphasised Aratus' debt in his extant commentary (exégesis) on the works of Eudoxus and Aratus which preserves many fragments of the former's treatise. It is generally accepted that the 1st half of Aratus' Phainomena is a verse setting of a lost work of the same name by the Greek astronomer Eudoxus of Cnidus. In composing his astronomical poem Phainomena, Aratus utilised an earlier prose work (4th-century BCE) on the constellations by the astronomer Eudoxus of Cnidos, known also as the Phainomena. It contained detailed information about the constellations and may have been one of the earliest works establishing a Greek constellation set. In his Phainomena Eudoxus provided calendaric notices of the risings and settings of stars. Eudoxus' Phainomena provided the basis for the 1st part of Aratus' poem. (The Phainomena appears to be based on two prose works - Phainomena and Enoptron ("Mirror", presumably a descriptive image of the heavens) - by Eudoxus of Cnidus, written about a century earlier. We are told by the biographers of Aratus that it was the desire of Antigonus to have them turned into verse, which gave rise to the Phainomena of Aratus; and it appears from the fragments of them preserved by Hipparchus, that Aratus has in fact versified, or closely imitated parts of them both, but especially of the first.) However, some modern scholars have suggested that Aratus' poem differed in numerous ways from the prose of Eudoxus. There is also reason to believe that Hesiod's Works and Days was the model used for Aratus' Phainomena. The poem can be divided/separated into 3 parts, the most important being his poetical description of the constellations, which forms the 1st part; followed by a discussion of the rising and setting of the constellations forming the 2nd part. (Lines 1-757 are believed to versify an earlier prose work on astronomy by Eudoxus of Cnidus (4th-century BCE).) The 3rd part (lines 758-1154) is called the Diosemeia ("Forecasts"), and is mostly about weather lore. The 3rd part of Aratus' poem concerned with weather signs may have been derived from the work, On Weather Signs by Theophrastus (but also identified as by modern scholars as the Pseudo-Theophrastus). Possibly Eudoxus may have made extensive use of On Weather Signs. When this part of Aratus' Phainomena was first given the separate title 'Signs' is unclear. The Diosemeia consists of forecasts of the weather from astronomical phenomena, with an account of its effects upon animals. It appears to be an imitation of Hesiod, and to have been imitated by Virgil in some parts of the Georgics. The materials are stated to have been taken almost wholly from Aristotle's Meteorologica, from the work of Theophratus, On Weather Signs, and from Hesiod. No mention of Hellenistic astrology is made in either of these poems. Aratus related the constellations to the seasons. However, Aratus (Phaenomena, lines 513-514) was not very interested in the seasons and when they began and ended. "On it [the imaginary line of the celestial equator, bisecting the imaginary line of the ecliptic] the days are equal to the nights on two occasions, at the waning of summer and again at the beginning of spring." (Aratus Phaenomena edited with introduction, translation and commentary by Douglas Kidd, 1997, Page 111.) The 'Diosemeiai' (the practical use of the constellations as weather signs), the 2nd main section of the Phaenomena has its own proem (introductory passage) (see lines 733-777). In the 'Diosemeiai' (depending on how the poem is divided), Aratus states that the moon tells what day of the (lunar) month it is (line 739, but see also lines 733-739), and the 12 signs of the zodiac are useful for telling the hours of the night, and also the phases of the seasonal year (lines 740-743, but also see through to line 751). It has also been concluded that Aratus did not target his poem towards readers with extensive knowledge or experience of astronomy or the practical uses of astronomy. The astronomical information contained in Aratus' Phainomena was not always correct. The lack of precision in the constellation descriptions indicate that Aratus was neither a mathematician nor observer or, at any rate, that in his Phainomena he did not aim at scientific accuracy. He not only represents the configurations of particular groups incorrectly, but describes some phenomena which are inconsistent with any one supposed latitude of the observer, and others which could not coexist at any one epoch. These errors are perhaps partly to be attributed to Eudoxus himself, and partly to the way in which Aratus has used the materials by Eudoxus. Hipparchus (about a century later), who was a scientific astronomer and observer, left a commentary upon the Phainomena of Eudoxus and Aratus, accompanied by the discrepancies which he had noticed between his own observations and their descriptions. However, the main appeal of Aratus' Phainomena may well have been its literary charm and also its numerous mythological allusions. Aratus enjoyed immense prestige among Hellenistic poets, including Theocritus, Callimachus and Leonidas of Tarentum. This assessment was picked up by Latin poets, including Ovid and Virgil. According to Acts (chapter)17:(verse)28, one verse from the proem to Phainomena, the opening invocation to Zeus, was quoted by the apostle Paul when promoting Christianity in Athens. The Acts of the Apostles, commonly referred to simply as Acts, is the 5th book of the New Testament. Acts and the Gospel of Luke make up a 2-part work, Luke-Acts, by the same anonymous author, usually dated to around 80–90 CE. Paul quotes the Phaenomena of Aratus to prove to the Athenians that their religion is equivalent to idolatry. Paul seeks to enhance his argument by citing an authority that the Athenians would respect. Aratus authored other poems but his Phainomena is his only extant work. Several poetical works on various subjects, as well as a number of prose epistles, are attributed to Aratus, but none of them have come down to us, except his 2 astronomical poems in hexameter. These have generally been joined together as if parts of the same work; but they seem to be distinct poems, the 1st, called Phainomena ("Visible appearances"), consists of 732 verses; the 2nd, Diosemeia ("On Weather Signs"), of 422 verses. In antiquity at least 27 separate commentaries were known to have been written of the Phainomena by Aratus. The ones by Theon of Alexandria, Archilles Tatius, and Hipparchus of Nicea survive. Several Roman writers translated it into Latin, including Marcus Tullius Cicero (106-43 BCE), the author presumed to be Iulius Caesar Germanicus (15 or 16 BCE-19 CE), and Postumius Rufius Festus Avienus (flourished mid 4th-century CE). (The complete Latin translations of Germanicus, and Avienus have survived. Only fragments of Cicero's Latin translation survive.) The popularity of the Phainomena in the ancient world was both widespread and enduring. After the epic Homeric poems Iliad and Odyssey it was the most widely read poem. Aratus' Phainomena was also one of the very few Greek poems translated into Arabic. An Arabic translation was commissioned in the 9th-century CE by the Caliph Al Ma'mun. The archaic Greek zodiac of the Aratean-Eratosthenic period was comprised of 11 figures positioned along the ecliptic. The 12 constellation zodiac of the Greek-Roman world originated in the 1st-century CE with the introduction of the Libra (in place of the Claws of the Scorpion). The different versions survive in a number of different celestial maps (likely produced to support to the comprehension of the first part of the Phaenomena) depicting either the Greek Aratean tradition or the later Latin Aratean tradition. See: Taub, Liba. (2010). "Translating the Phainomena across genre, language and culture." In: Imhausen, Annette. and Pommerening, Tanja. (Editors). Writings of Early Scholars in the Ancient Near East, Egypt, and Greece. (Pages 119-138). By the early 4th-century BCE the basic theory of the celestial sphere (i.e., ecliptic (and zodiac), equator, tropics, arctic circle, horizon, wandering stars (= planets), and the Milky Way) had been established by the Greeks. The incorporation of technical and/or scientific information into (ostensibly) didactic poetry was a mark of the Hellenistic period (323-30 BCE), especially in Ptolemaic Alexandria. Examples, in addition to Aratus' Phainomena include: Theriaca (about poisonous animals and insects) and Alexipharmaca (about antidotes) by Nicander of Colophon (2nd-century BCE), a Greek poet, physician and grammarian. However, the literary dimensions/intent of these poems (and their Latin generic descendents) are not to be overlooked when investigating them for information. The technical/scientific information is often subservient to the literary purposes for which that information is used. The astronomical sense of phainomai = "things that are seen/appear in the heavens." An early division was introduced between the astronomical part (referred to as Phaenomena, comprising the first 757 verses) and the later weather/meteorological lore part (referred to as Diosemeia ("Forecasts"), comprising the later 383 verses). Lines 19-758 are theoretical; lines 758-1141 are practical. A very detailed structural outline (12.5 pages) of Phainomena appears in, Sky-Signs: Aratus' Phaenomena. Introduction and Translation by Stanley Lombardo (no date, but 1983). (1) The names and related positions of 46 constellations, beginning at the north celestial pole. (3) The demarcation/separation of the constellations in the northern celestial hemisphere from the constellations in the southern celestial hemisphere. (4) The names of the Signs of the Zodiac, beginning with the Crab through to the Twins, and the explanation that the sun moves around this circle. Aratus omits any mention of astrology. Interestingly, Eudoxus was known in antiquity for his rejection of astrology. (5) There is no mention of the moon's orbit. The interest of Aratus' Phainomena is the perfection of the celestial realm. Note: Firm evidence of a 360 degree zodiac in Greece comes only from the 2nd-century BCE with Hypsicles (a Greek astronomer of Alexandria, circa 190-120 BCE) and Hipparchus. The zodiac became one of the fundamental tools of Greek astronomy and astrology. In his Commentary Hipparchus was motivated to refute some of the assertions of 2 earlier writers, Aratus of Soli (310-245 BCE) and Eudoxus of Cnidos (circa 408-355 BCE). "In this paper I examine how Hipparchus of Nicaea (fl[ourished]. 147-127 [BCE]) created and maintained a stable professional identity for astronomy. Hipparchus has long been known in the scientific world as the father of astronomy; though this honorific owes in large part to his monumental advances in the discipline, I argue that at least some of the credit is due to the strategies of self-fashioning found in his only surviving work, the Commentary on the Phaenomena of Aratus and Eudoxus. That he was successful in creating a model for the field, and in placing himself at its apogee, is evident: though he was nowhere near the first professional astronomer, his is the earliest astronomical treatise that survives. Faced with shaping a nascent discipline and correcting cosmological fiction masquerading as fact, Hipparchus finds it easiest to define astronomy by what it is not: two-thirds of his commentary is given over to pointing out the errors of earlier practitioners of the science. His tone is brusque and often highly polemical, and he does not shrink from criticizing fellow professional astronomers such as Eudoxus and Attalus. But Hipparchus is also in the unique position of having to take on a poet. By his time, Aratus' poem had achieved great popularity, and Hipparchus was clearly concerned that many received their sole astronomical knowledge from it. He offers a careful catalogue of Aratus' mistakes and denounces the illusory authority that dactylic hexameter lends an author. If Aratus' Phaenomena had been in prose, Hipparchus argues, no one would have accepted a text so full of errors. It is with this argument, I contend, that Hipparchus makes his most important contribution to his field. His critique of his professional predecessors may have solidified his position as an astronomer, but it was his passionate defense of professional expertise over poetic authority that secured the status of astronomy." The point has been made that Hipparchus' criticisms of Aratus' precision in his Commentary eventually becomes fused, in the Roman period, with the tradition of the Phaenomena. Hipparchus' criticism of Aratus' precision was seen as demonstrating the problem with using poetry to convey technical knowledge. The unexpected effect of Hipparchus' Commentary was to update Aratus' poem, and enhance its relevance. It is indicated that in the Roman period of the 1st-century CE Hipparchus and Aratus were read together as a unit of astronomical authority. Prose star catalogues were later created by Hipparchus of Rhodes 2nd-century BCE), Geminus of Rhodes (flourished 1st-century BCE), and Martianus Capella (flourished early 5th-century CE). Hipparchus' Commentary on the Phaenomena of Aratus and Eudoxus (which survives fully intact, the only ancient commentary to do so) takes the form of a continuous prose treatise. In it he catalogues the errors of Aratus' Phaenomena. In books 2 and 3 of the Commentary all mention of Aratus of Soli, Eudoxus of Cnidus, and Attalus of Rhodes are dropped and Hipparchus introduces his own observations/discoveries in catalogue form. According to Jessica Lightfoot, Hippachus is seeking to establish his Commentary as the most authoritative astronomical text. According to Caroline Bishop, choosing the commentary form to publish original research was not unusual in antiquity. Note: Prose is the ordinary form of spoken or written language, without metrical structure, as distinguished from poetry or verse. Poetry is a literary work in metrical form. See the excellent article: Hipparchus' Didactic Journey: Poetry, Prose and Catalogue Form in the Commentary on Aratus and Eudoxus by Jessica Lightfoot (Greek, Roman and Byzantine Studies, Volume 57, Number 4, 2017, Pages 935-967). The Latin writer Rufus Festus Avienus (also, Anienus) (4th-century CE), translated Aratus’ Phaenomena into Latin Verse. At the very beginning of the 17th-century (1600) the teenage Dutch scholar (later humanist, philosopher, legal scholar, and jurist, and also a statesman and diplomat) Hugo Grotius (also, Hugo, Huigh or Hugeianus de Groot) (1583-1645), who had been a student of the philologist, historian, and chronologist Joseph Scaliger at Leiden University, produced an edition of Aratea of Aratus, Cicero, and Germanicus, titled, Syntagma Arateorum ('A collection of Arateas'). Grotius was 17 years old when he published the Syntagma Arateorum. Grotius was a child prodigy and entered Leiden University at age 11. Because Cicero's Aratea only survived in a fragmentary condition (the text is incomplete as example: Harley 647 in the British Museum), Grotius provided the missing parts from Cicero's Aratea by translating the equivalent Greek from Aratus' Phaenomena, and writing the translation in Ciceronian verse. Groteius's added lines of translation from Aratus' Phaenomena into Latin were printed in italics. Jean Soubiran' interpretation (Aviénus, Les phénomènes d'Aratos, edited by Jean Soubiran (1981) of the Cicero MS. reading 'nubila' at verse/line 469 (of Cicero) - as against Grotius's emendation 'vincula' - is accepted. Soubiran's corrected reading was first published in: Jean Soubiran, "Une mention antique de la nébuleuse d'Andromède (Aviénus, Arat., 469)." in Revue de philologie, de littérature et d'histoire anciennes, Volume 51, 1977, Pages 207-216). Soubiran (1932-?) is/was a French Latinist (Professeur à l'Université de Toulouse Le Mirail, Centre de sciences anciennes). The manuscripts of Avienus read 'nubila' ('clouds') at line 469, referring, it is thought, to the chains of Andromeda. Grotius did not understand the sense of this and proposed to 'emend' the text into 'vincula' ('chains'), likely thinking that verse/line 469 had been corrupted during the course of copying the text by hand during the Middle Ages. Grotius' unattested modern alteration was done without knowledge of the the visual appearance of Andromeda in the sky. Knowledge of the easily visible nebulous patch M31 enables and understanding of Avienus' allusion. Grotius had not understood the sense of this. Nothing at all is known about Minoan constellations. Everything is speculation/conjecture. In 2005 Evangelos Kyriakidis (Lecturer in Classical and Archaeological Studies at the University of Kent) published his conclusions ("The Unidentified Floating Objects on Late Minoan Seal Iconography." (American Journal of Archaeology, Volume 109, 2005, Pages 137-154)) that the series of unidentified 'floating' objects/ ornamentations comprising dots and drop-like symbols on Minoan seals and gold 'signet rings' found in late bronze age (dated 1600-1700 BCE) contexts in Minoan Crete and mainland Greece are representations of constellations, most of which bear a strong physical resemblance to modern day constellations and their position in the sky (i.e., Orion and Pleiades on the Minoan seal in the Ashmolean Museum). (Prior to this the illustration on a Minoan seal of a man standing with a raised bow had been compared to the constellation Orion.) Kyriakidis argues that his interpretation makes it much more likely that bronze-age Minoan Crete is the source for the later Greek constellation set as the constellation-patterns more closely resemble the later Classical Greek ones much more than any Near Eastern or Middle Eastern examples. Kyriakidis also suggested that the Minoan system of constellations was depicted at times of ritual observances. Kyriakidis also believes that the identification of Minoan constellations helps illuminate the applied knowledge of the bronze-age Minoans regarding calendars, navigation, agriculture, superstition, religion, mythology, and story-telling; a window into the workings of the Minoan mind. Dr Evangelos Kyriakidis FSA is currently (2012) Senior Lecturer Classical & Archaeological Studies, University of Kent, UK. Prior to his appointment at University of Kent he was Cotsen Visiting Scholar in the Institute of Archaeology, UCLA (University of California Los Angeles). At University of Kent he is currently Senior Lecturer in Aegean Prehistory and has wide interests in Mycenaean Administration, Minoan Religion and Iconography as well as Ritual Theory. He is also interested in the history of archaeological thought and in archaeological site management and planning. Circa 1500 BCE (late 2nd-millennium BCE) - Several royal tombs in Egypt have ceiling/wall paintings of constellation figures. In the New Kingdom period (circa 1500 to 1100 BCE), the constellational representations were painted on temple ceilings (i.e., the Ramesseum ceiling) and on the sepulchral vaults of kings (i.e., the tomb of Senmut). However these are not accurately drawn and are essentially decorative. Circa 650 BCE - The Assyrian planisphere K 8538 is a circular star map, divided into equal 8 sectors, with constellations depicted in addition to written constellation names, star names, and symbols. 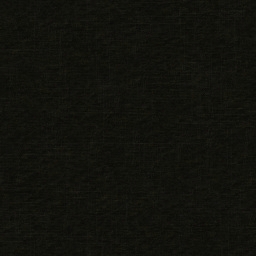 It is not a depiction of the whole visible sky. Circa 300-100 BCE - Kugel celestial globe may be the earliest celestial globe to survive from antiquity. It does not follow the Graeco-Roman astronomical norms of the period as defined by the astronomer Hipparchus. The size and positions of a number of constellations are misplaced. Circa 150 BCE - Farnese globe depicting most of the Aratean constellation figures (but not individual stars). Believed by art historians to be a Roman copy of an earlier (presumably) Greek original. It is generally thought that the existing sculpture was made in Rome circa 150 CE and is a late copy of a Greek original made circa 200 BCE. Stars may have been painted on the marble globe. Circa 140 CE - Ptolemy's descriptive star catalogue with the placement of stars within Eudoxan/Aratean constellation figures. The constellation list in Ptolemy's star catalogue standardised the Western constellation scheme. Circa 150-220 CE - The Mainz celestial globe is a complete celestial globe in that it depicts all 48 Classical constellations (but does not fully agree with the star-catalogue of Claudius Ptolemy) with relative precision. Circa 670 CE - Chinese Dunhuang star map depicting the whole of the sky visible in China. The oldest known manuscript star chart and, excluding astrolabes, it is the oldest existing portable star map known. Circa 715 CE - The Aratean constellation set painted on the domed ceiling at the bath house of the Arab palace at Qusayr 'Amra (Jordan). 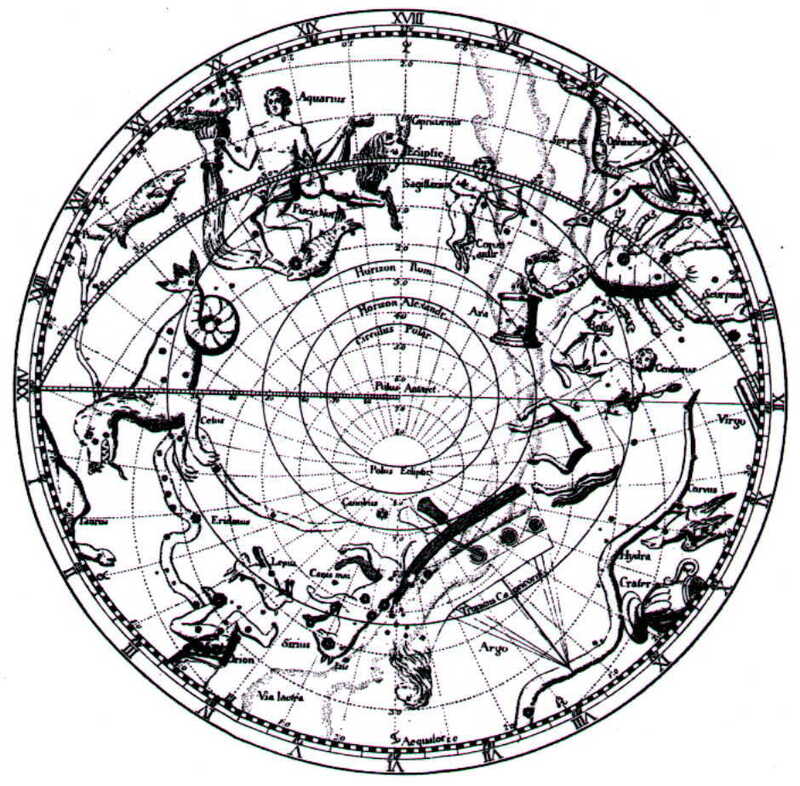 The constellation depiction/mapping mostly followed the Ptolemaic tradition. Circa 820 CE - The Leiden Aratea is a 9th-century CE copy of an astronomical and meteorological manuscript based on the Phaenomena written by the Greek poet Aratus The evidence suggests the Leiden Aratea was probably produced in the royal scriptorium, possibly in 816 CE.) The manuscript contains 39 full-page miniatures. Circa 1009/10 - Al-Sufi's book on the fixed stars. In al-Sufi's Kitab suwar al-kawakib the constellation figures and the individual stars comprising them are shown separately (i.e., separated from each other) without any information on their relative positions being given. No sky map (with all the constellations charted) appears in the book. There are a number of confusions still being held/perpetuated regarding systems of stars in Egyptian, Babylonian, and Greek cultures, and their apparent connectedness. This has to do with the number 36. Also, the mistaken statement continues to be made that there were originally 18 stars in the Babylonian zodiac. This latter mistaken idea can be readily corrected as mistaking the pre-zodiacal Mul.Apin series system of 18 (marking/reference) 'stars' in the path of the moon as a Babylonian zodiac or proto-zodiac. The Mul.Apin series reflects/follows the Babylonian astrolabe system (but in a more sophisticated way). The Mul.Apin series incorporates a refinement of the astrolabe system and then there is a post Mul.Apin series changeover to a zodiacal system. The Babylonian proto-zodiac of 12 (unevenly spaced) constellations was derived from modifying the system involving 18 stars in the path of the moon. Interestingly, I have seen references to the early Babylonian zodiac having 36 reference stars. This is an error. (1) The 36 star system of the Enuma Elish was zodiacal and set out decan stars. Example: "This text explains the division of the sky into the twelve constellations or the zodiacal signs, each of which are divided into 3 decans, represented by three stars." (2) The 36 star system of the Enuma Elish is the same as the Egyptian 36 star decan system. Example: "I … thought it was 3*12 (an 'obvious' link with the Egyptian decan stars). But then I read … that it were three bands of 12 stars: one on the ecliptic (sic), one band on the south side of ecliptic (sic) and another on the north side of it. So something different perhaps?" (4) The 36 star system of the Enuma Elish/Astrolabes denoted 10 degree divisions of the sky. Example: "… I … find it culturally interesting that the Egyptians talk about 36 decan stars with a regular interval of 10 days, while the Mesopotamian culture talks about three bands of 12 (of a month: ~30 days). Or would they still have a regular interval of 10 days? Three bands of 12 does not have to negate 30 intervals of 10 days ...."
Confusion of systems of 36 stars originates with people using 100 year old plus sources for their understanding of star systems in Babylonian culture. The confusion usually starts with the early astronomical commentaries on the Enuma Elish (typically, The Seven Tablets of Creation by Leonard King (2 Volumes, 1902). The Babylonian Enuma Elish, which dates perhaps late 2nd-millennium BCE sets out how Marduk arranged the heavens. In the older sources the Enuma Elish is mistakenly identified as a creation myth but it actually relates Marduk's rise to kingship over all the other gods/goddesses of the Babylonian pantheon. The British assyriologist Leonard King believed the Enuma Elish described Marduk as establishing the zodiac. This is incorrect. Strangely, some persons believe, from King's explanation, that Marduk is establishing the zodiac and sub-divisions of decans. Marduk is not establishing the zodiac and certainly not the sub-divisions of (zodiacal) decans. Marduk is establishing the '3 ways each' of the so-called 'astrolabe' scheme. Marduk (as king of the gods/goddesses) established the astrolabe scheme of 36 stars – not the zodiacal scheme (and decans i.e., 3 divisions of each sign). The astrolabe system comprised 3 bands with 12 stars in each band, comprising a so-called paranatellonta. The assyriologist David Brown has made the point that in 'Enuma Elish' Marduk arranges the stars in the image of the ideal year scheme of the so-called 'astrolabes' (3 [month] stars each), which primarily served a divinatory purpose. Wayne Horowitz has pointed out Astrolabe B (KAV 218) from the 12th-century BCE would date only shortly prior to the composition of Enuma Elish. The Babylonian title for the so-called astrolabes is mul.meš.3.ta.àm (= "the stars, three of each"). The astrolabe genre of texts was a simple fixed-star scheme. The late Johannes Koch (1989, Page 120) pointed out the circular astrolabe served as an orientation guide and an aid to remembering which stars appeared in which parts of the sky. Regarding the paths of the '3 stars each' in the astrolabe genre of texts. In the older literature the stars comprising the 'path of Anu' comprising the central band of sky were frequently stated to be ecliptic-based. More modern literature/studies holds this to be incorrect. The central band of sky comprising the 'path of Anu' was not ecliptic-based; it occupied (but was not identified with) the equatorial region/celestial equator. The system of decans did not originate in the Babylonian astrological system. The decan relationship to the Babylonian-Greek zodiac is the Egyptian system of decans. The 36 (decan) star system of the ancient Egyptians is different to the 36 star Babylonian astrolabe system marking the 12 months. The original system of Egyptian decan stars independently established during the Old Kingdom period were a set of 36 rising stars/asterisms that were likely positioned south of the ecliptic. The system of decans did not originate in the Babylonian astrological system. The decan relationship to the Babylonian-Greek zodiac is the Egyptian system of decans. The 36 (decan) star system of the ancient Egyptians is different to the 36 star Babylonian astrolabe system marking the 12 months. The later Greek-Roman decanal segments – 10 degrees of the zodiac – though originating from Egypt, were segments not stars. The Egyptians had 36 decan stars. Also, it is generally believed the original set of Egyptian decan stars were not along the ecliptic. They basically comprised 36 stars/asterisms along a single linear star path south of the ecliptic. There are 36 stellar sectors on the circular astrolabes (manzazu), 1 stellar sector for each of the 36 stars. However, no decan system is meant by Marduk in the Enuma Elish. The astrolabe system is a scheme of 3 divisions (paths) of the sky each path having 12 month stars. In order to posit that the Enuma Elish is somehow connected with or similar to the 36 stars of an earlier Egyptian system and a later Babylonian-Greek system (which is a different scheme entirely) the 36 stars of the Babylonian astrolabe system would have to be disconnected from the astrolabe system – which makes no sense. Also, it is not possible to claim legitimacy for the 12 ecliptic star groups or rather signs, with each star group (sign) being divided into 3 parts, as a 36 star system. But the 36 decans of the Babylonian-Greek zodiacal systems are not stars but segments. Also, the system of 36 monthly stars of the Babylonian astrolabe system were not in a linear path but divided between 3 bands marking the sky. The Babylonian-Greek zodiac was defined by the sun rising within a specific constellation/sign. The later Babylonian-Greek zodiac and decan system does not equate to the 36 star system of the astrolabes. The late zodiacal system was not based on 3 monthly stars, each star being from a different band in the sky. It appears persons believe the zodiac system kept the 3 paths (3 stars each) concept of the astrolabe system and simply changed the central emphasis to the ecliptic – meaning the 12 divisions of the zodiac resulted from the earlier 12 star system. It is not possible – and not accurate - to equate the 'equatorial' (used here for simplicity, not accuracy) astrolabe system (comprising 3 star paths of 12 calendar stars) with the later ecliptic-based zodiacal system of 12 constellations (later signs). The astrolabe system of 3 bands in the sky was not carried over to the ecliptic system of zodiacal constellations (later signs). The zodiacal scheme was a different system. There was a 'cross-over' period in late texts when the astrolabe system or the zodiacal system could both be used (as well as the ziqpu stars). Regarding the scheme of the Sphaera Barbarica. Teukros 'of Babylon,' 1st-entury CE, made a register of stars that rose to the north and south of each zodiacal sign. Teukros' work was important in the transmission of the astrological system where the zodiac of signs was subdivided into 36 decans, each one a 10 degree segment, 3 decans for each zodiacal sign; and also for the so-called paranatellonta (i.e. the constellations rising on the horizon simultaneously with a certain decan). Teucer also noted those stars (or parts of constellations, not necessarily zodiacal) which rose with each of the decan segments of the Greek zodiacal signs. 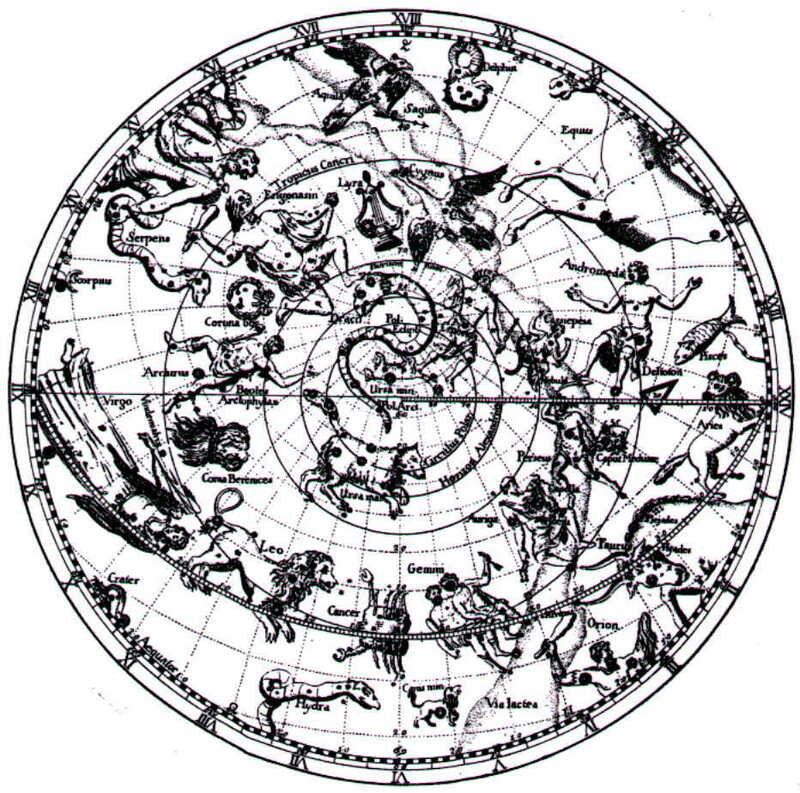 The Sphaera Barbarica, basically comprising decans and paranatellonta, was an astrological sphere. The Egyptian zodiacs are late and originated in the Hellenistic and Roman periods. There was no other native Egyptian zodiac scheme before this. The extant Egyptian zodiac depictions are Babylonian-Greek. The late Egyptian 12 constellation/sign zodiac was introduced in the Greek-Roman period (1st-century BCE). This Web Page was last updated on: Tuesday, May 15, 2018, 12:30 pm. This Web Page was created using Arachnophilia 4.0 and FrontPage 2003.